Peaches are at their peak here in Western North Carolina. A neighbor brought us some from the farmer’s market earlier this week and I’ve been enjoying them every day. You may have noticed that peaches are prominent on the cover of Miracle in a Dry Season. I’ll tell you a secret. I wasn’t all that keen on the peaches when I first saw the cover. They’re gorgeous, but when I see peaches I think of Georgia not West Virginia. 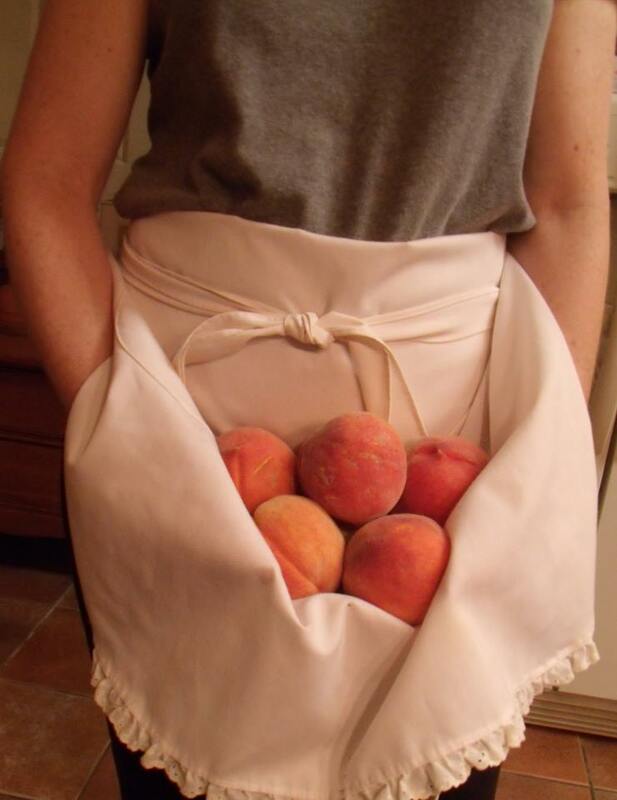 I would’ve pictured apples or maybe brown eggs in that apron. But now I LOVE the peaches. They’re so lush and they almost seem to glow. Plus, Perla makes a peach cobbler. And we did have a peach tree on the farm in WV. Yes, Appalachian peaches! My friend and chef Dale Hawkins of Fish Hawk Acres in Rock Cave, WV, supplied me with a recipe for Perla’s Peach Cobbler. If you, too, have an abundance of the fruit, I highly recommend trying it this weekend. Preferably with some freshly churned ice cream on top. Preheat oven to 325 degrees. Melt butter in a 9×9 baking dish. Blend flour, baking powder, sugar, and milk. Pour batter in baking dish over melted butter. Sprinkle peaches on top of the batter. Bake for 1 hour or until golden brown. Serve warm with freshly whipped cream or homemade vanilla ice cream. mmmmmmm!!! I just might try this…when the house is empty and…yeah. I love the cover of your book. It’s in my stack to read. I’m a librarian so it may take a while for me to get to it. I baked a peach cobbler yesterday. My recipe is very similar to yours. We call it “The Three Cuppa” 1 cup self-rising flour, one stick butter, one cup sugar, one cup milk and for the star of the recipe – 2 cups peaches. Bake one hour. It’s so easy, even I can do it. The cover is pretty gorgeous! I know about that TBR stack–I have one that could topple and bury the dog. Yup, a stick of butter is always a good place to start with any recipe! And I’ve never quite gotten over the guilt of wasting good fruit!